We love chic, stylish small spaces. Finding the perfect details to make a space come together is just as important as adding the right accessories to an outfit. I love home interiors just as much as I love fashion. To me they are linked; they both apply the same principles of color, texture, scale and proportion. I love that there are great local home decor shops like (my personal favorite) The Garage Collective. Of course, there are so many more all over Southern California, ohh another amazing shop is Caravan West. I also love that boutiques have embraced adding some home items into there selection of merchandise. At both Prism and Iris + Poppy you can find cool decor pieces to add something special and unique to your home. Check out a few stylish small spaces that have recently inspired me. I purchased a very similar bench as the one pictured. And as a photographer this gave me a great idea of how to style a wall in my home with the bench (that needs a permanent home). We all have cameras with us everywhere we go, and this is a great way to show off our creative side in a stylish and cost affective way. Great ideas can come from simple scroll on websites you love, like this one, and of course there’s everyone’s favorite, Pinterest. The perfect addition to any corner! We love our baskets with a potted plant sitting inside, a blanket draped over the edge or just sitting pretty + used for storage! A simple, frameless mirror is a great way to add a cool clean vibe to a space while reflecting light. Mixing textures and styles works with your home just as well has your outfits. I love the contrast of the sleek, simple white plant holders with the organic tree stumps. And of course this oversized mirror is a great way to give the illusion of more space. 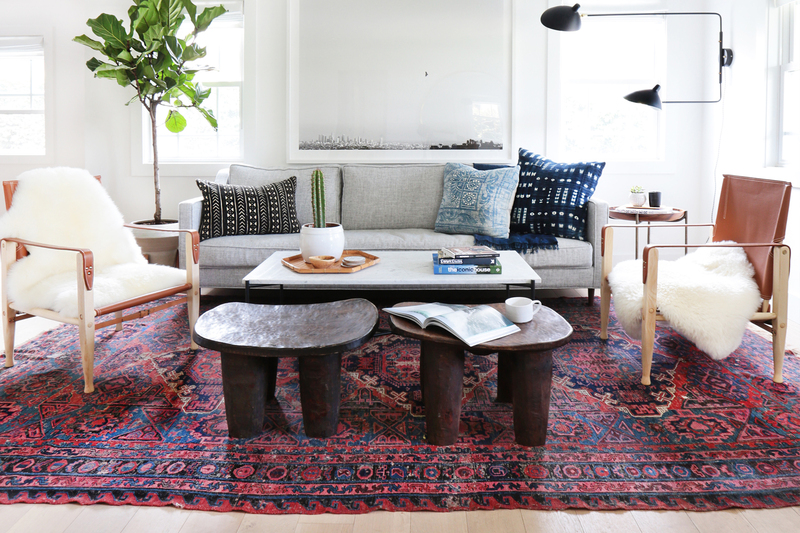 Layered rugs are one of my favorite styling tricks. This is also a great of example of balancing large and small scale plants. This is a great entry area idea. All I have to say is, I’m a sucker for a cool chair! A vintage bench can make a major statement in a small niche or hallway. Style your bench with a special lumbar pillow, area rug, and of course you always need a plant. Make sure to check your neighborhood home decor shops and boutiques. So many times they support local makers and designers that might just be your neighbors. Happy Decorating + Supporting Local.